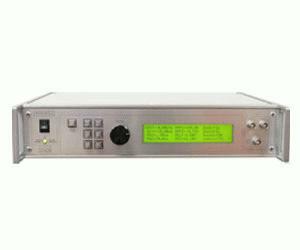 Model AV-1021-B is a general-purpose 10 MHz lab pulse generator that includes IEEE-488.2 GPIB (and RS-232) computer control of amplitude, polarity, DC offset, pulse width, pulse repetition frequency, trigger mode and delay. The unit features a front panel keyboard and adjust knob control of the output pulse parameters along with a four line by 40 character back-lit LCD display of the output amplitude, polarity, pulse width, pulse repetition frequency, DC offset and delay. be triggered by its own internal clock, by an external TTL-level signal, by the front-panel “Single Pulse” pushbutton, or by a computer command. The internal clock is variable from 1 Hz to 10 MHz. A double pulse mode is available and a gate input is provided for synchronous or asynchronous control of the triggering. The output pulse width and delay are variable from 20 ns to 0.5 sec. The rise time of the main output is 10 ns. A 5 ns rise time option is also available. A burst mode option is also available.